As you shop for new clothes and accessories, you may be curious as to how you can know if a garment is eco-friendly. Of course, you can look for fair trade labels or organic fabrics. There’s an easier way, though. You can simply shop for clothes that are sold by Certified B Corp and bluesign verified companies. Some of the brands you know best are Certified B Corporations. Ben & Jerry’s, Patagonia and Athleta are just a few examples. So what does it mean to be a Certified B Corporation? Well, these companies are committed to transparency in social and environmental considerations. They share a mission to do business in a sustainable way with a focus on the planet and the global community. There are over 2,500 Certified B Corporations across the world. Business sizes range from small to multinational, but share a common vision that includes sustainability, fair trade practices and attention to social responsibility. Companies that wish to gain B Corp certification subscribe to impact management methods and apply for certification through third party, independent B Lab. Whether you’re shopping for ice cream or a new parka, you can buy confidently from Certified B Corporations. Bluesign, like B Labs, is a third party independent certification group. Bluesign is primarily focused on ensuring that textiles are manufactured and produced in an eco-friendly and sustainable manner. Bluesign approved textiles and garments eliminate harmful substances in production from the very beginning of the process. To be bluesign certified, a garment must meet requirements for water emissions, air emissions, resource productivity, consumer safety and the safety of workers. Companies that have chosen to become bluesign verified include Eileen Fisher, Patagonia and ASICS. Are you ready to see what Certified B Corp and bluesign verified options are out there? From American apparel brands to bathing suits to sweaters to leggings to running shoes this list is just a sample of what you will find in today’s market. Here’s our list of the top eco-friendly, Certified B Corp and bluesign products. First on our list of the top eco-friendly, Certified B Corp women’s clothing is out Synergy Organic Clothing review. Synergy Organic Clothing is a California based business that features sustainable, fair trade clothing in its product catalog. The Boyfriend Tee from Synergy Organic Clothing is no exception. Handmade in GOTS certified organic fabric by female artisans in India, the flowy shirt is a great addition to any woman’s wardrobe. Soft lines give this eco-friendly shirt a feminine appeal; pair it with a pencil skirt to wear to the office, or with your favorite jeans for a more casual look. In addition to paying women a fair working wage to handcraft clothing, the designer also uses sustainable fabrics in its apparel. Organic cottons and natural hemp are examples of fibers the company loves to use. Cotopaxi is another of our favorite Certified B Corporations. The company has, since launch, actively funded non-profits like Proximity Designs, Educate Girls and Nothing But Nets – groups that promote education for women, environmental initiatives and humanitarian causes. For our Cotopaxi review, we’ve chosen the Quito Active Tank. This top is ideal for hitting the gym or running on warm days. It’s crafted from sustainable Tencel as well as recyclable polyester, creating a moisture-wicking and super cool material that feels soft against your skin. Women who have shopped the Cotopaxi Quito Active Tank say it’s a great baselayer in cooler months but works great as a standalone top in warmer weather. Reflective logos keep you safe while you hit the road at night, and seamless armholes prevent rubbing and chafing. We’ve featured United by Blue reviews elsewhere on Citrus Sleep. We love the American apparel company not only because the clothes look and feel great, but because the business finds many ways to give back to the global community. For every purchase made at United by Blue, a pound of trash is removed from waterways. The company even sponsors paid time off for employees to participate in these cleanups. The Bowman Printed Button Down shirt is made from organic cotton and sustainable hemp fibers. Choose from two colors – purple and green are both vivid jewel tones that look great as part of a casual outfit. A high-low hem gives you coverage where you need it, and a large chest pocket gives the shirt a classic look. Women who have worn this top say the size runs on the larger side. Order your size for a roomy feel, or choose a size down for a more fitted look. NAU is a clothing company that makes use of many sustainable, eco-friendly fabrics. Recycled down, hemp, Tencel and alpaca wool are just a few examples of fibers the company chooses for its earth-friendly product line. Our NAU review features this Basis Capsleeve T-Shirt, made from 100% enzyme-washed organic cotton. Soft and breathable, the capsleeve tee is your best bet for casual weekends or even yoga sessions. Layer the tee under a sweatshirt or wear it outdoors on sunny summer days. You can choose from three neutral colors to complete any look. As we researched for our NAU review, we learned that the company donates 2% of all profits to Partners for Change. Conservation Alliance, Mercy Corps and People for Bikes are three non-profits that have benefited from NAU’s give back philosophy. MPG Sport fashions have been featured in magazines like US Weekly, Redbook and Shape. We love the “athleisure” look of the MPG Sport line, and this Color Block Legging is one of our favorites. An interesting take on a classic, this legging features mesh pockets, moisture-wicking abilities and a drawcord waistband. You’ll like the little details, too: reflective logos protect you at night, and a small mini-pocket holds your key or ID. We’ve included MPG Sport reviews in other product lists. The company was founded in 2002 by refugees to Canada. Apparel sold through MPG Sport is bluesign verified and the group adheres to strict sustainability practices. The Mondetta Charity Foundation is an important part of the MPG Sport mission, too. Launched in 2004, MCF gives back to global communities to allow educational opportunities. Patagonia is one of the planet’s most socially conscious, eco-friendly companies. The group launched 1% for the Planet in 2002 as a way to connect businesses with deserving non-profits. Patagonia gives back a portion of its net profits each year. Additionally, the company is committed to sourcing products through fair trade work, using sustainable materials when possible. For our Patagonia review, we’ve chosen the Women’s R1 Lite Yulex Long Sleeved Spring Jane. This wetsuit or bathing suits is perfect for women who want to hit the waves, but it’s also a great option for just swimming laps. Better yet, the spring suit is made from eco-friendly fibers. Yulex, a plant-based rubber as well as recycled polyester give this spring suit stretch and warmth. The rubber is sourced from forests certified by the Forest Stewardship Council to be sustainable. Every spring suit is certified Fair Trade made. Women who own this wetsuit say the fabric is warm enough even for fall surfing. The suit is rated for water temperatures between 65 to 75 degrees. Are you looking for a sustainable, eco-friendly shoe for trail running? Our ASICS review has you covered. The Women’s Gel Kahana 8 Trail Runner is ideal for running on rugged terrain, with superior traction and a breathable upper to keep you cool. Gel cushioning provides support for your feet and improves stability as you move. Women who have worn the ASICS Gel Kahana 8 say the shoe retains its shape even after hundreds of miles. The shoe is roomy in the toes so as not to cause injury, and most women become repeat customers! Choose from five colors (we love the Dark Steel and Pink Glow) and sizes from 6 to 12. Most women recommend you order a half size up for the perfect fit. ASICS is an environmentally friendly company. The business also participates in Give Back Box, an initiative to keep waste from ending up in the landfills. Simply print a free shipping label and donate used clothes, shoes and more to local charities. In addition to the Give Back Box, ASICS has committed to reduced emissions, water use and the use of sustainable fabrics and materials where possible. If you’d rather hit the gym then the trail, this PUMA review is what you’re looking for. The PUMA Women’s Tazon 6 Cross Trainer shoe is a versatile sneaker; women say it’s perfect pair of running shoes or even spin class, treadmill use or even yoga. Of course, we also love that it’s a sustainable, eco-friendly shoe. PUMA has been committed to sustainability for years. The company has set 10for20 Targets, a list of 10 sustainability standards they’re striving to achieve by the year 2020. Social compliance, chemical discharge and health and safety standards are among these, and the company publishes its goals online. The Women’s Tazon 6 Cross Trainer is made using bluesign approved materials, from the synthetic leather upper to the rubber sole. EcoOrthoLite fabric incorporates bio-oils into production rather than petroleum. All shoes are made under fair trade working conditions. What we love best about the shoe, however, is that it’s super comfortable! Wear this to work out or just as an everyday shoe. 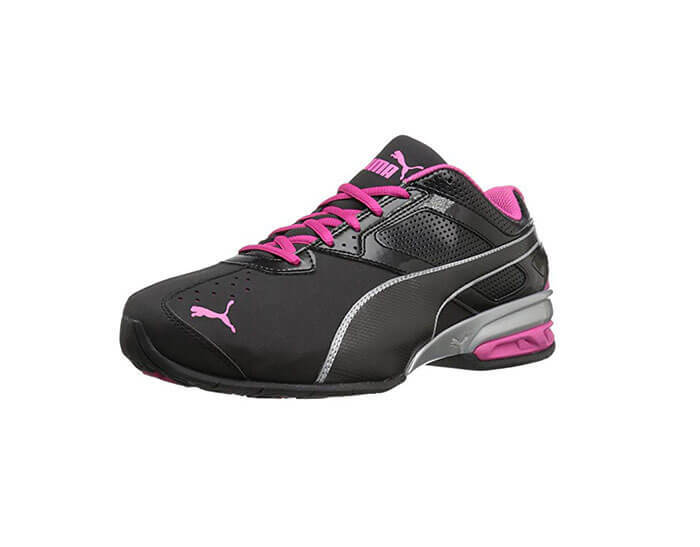 You’ll love the breathability, support and the look of the PUMA Tazon 6 Cross Trainer. Columbia is another company we feel good about supporting. We’ve covered Columbia reviews in the past because the company has a history of giving back to the global community. Partnering with organizations like Planet Water and EmpowerHer, Columbia is one of the most philanthropic active wear companies in the world. 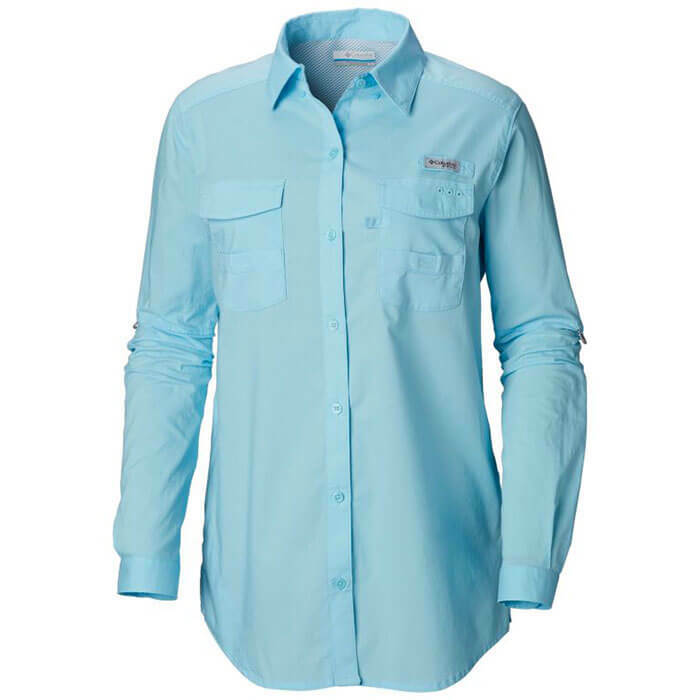 The Women’s PFG Bonehead II Long Sleeve Shirt is crisp, clean and comfy. Women who have worn the shirt say it’s perfect for casual Fridays, but they love to wear it on the water, too. As with all Columbia products, you’ll find that attention was put into the crafting of the shirt – it’s going to last a lifetime. The details are what you’d expect from Columbia, too. The shirt features plenty of pockets and a vented back. A rod holder and utility loop make the shirt perfect for fishing. Lightweight poplin is the perfect fabric for breezy summer days on the water, and the shirt is machine washable. Choose from four colors or buy one of each to stock your wardrobe with eco-friendly, sustainable options. Another of our favorites for outdoor play is the Mountain Hard Wear Karsee Long Sleeve Pullover. This blended flannel shirt is made from Tencel, a fabric sustainably made from wood pulp. That means a soft, breathable and biodegradable piece that’s durable and eco-friendly. Four functional buttons create a unique look for this otherwise classic pullover. Two chest pockets also lend utility to the shirt. Women love the Karsee Long Sleeve Pullover as a work shirt, but say it’s comfortable enough to wear around the house, too. Dropped shoulders let you move and stretch and a generous bottom hem gives you the coverage you want. We’ve chosen to feature a Mountain Hard Wear review because the company has a reputation for durable construction and for social responsibility. Garments are made under fair trade working conditions and Mountain Hard Wear is actually a subsidiary of Columbia. Columbia, as you may know, is a member of the Sustainable Apparel Coalition and the Sustainable Working Group. The North Face is another company you’re likely familiar with. The company is one of the largest brands of outdoor wear and equipment, designed to last and provide protection as you play outside. The North Face Apex Flex GTX 2.0 Jacket is an example of the essentials that North Face offers. It’s a wide-resistant, water repellant piece that’s made from eco-friendly materials! 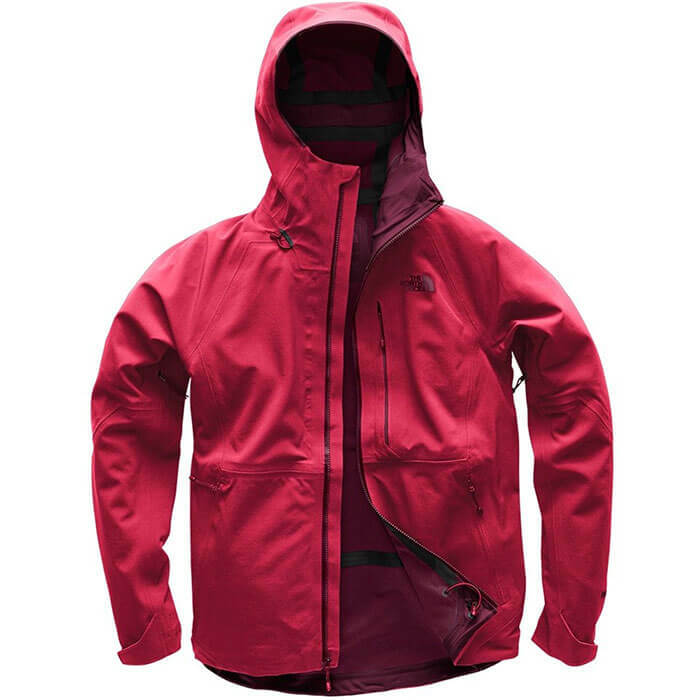 This jacket is made from 100% bluesign approved nylon, dubbed WindWall by the company. Women who wear this jacket say it’s just the right fit for spring days and windy weather. Whether you’re fishing or just walking the beach, the Cyclone 2 will keep you warm and dry. As we explored the company for our North Face review, we learned that the company has launched a recycling program. Used clothing is recycled and refurbished to keep those fabrics out of landfills. Insulated coats, fleece wear and more is available in The North Face Renewed product line. Your purchase of The North Face Apex Flex GTX 2.0 Jacket supports non-profits, too. The North Face partners with groups like The Conservation Alliance to give back to environmental programs. The Marmot Tempo Women’s Softshell Jacket is your new go-to for outdoor activity. Horesback riding, hiking, and even climbing are made more comfortable when you grab your Marmot Tempo. You’ll love the waterproof fabric as well as deep, zippered pockets. A drawcord hem keeps the wind off your skin, and a high collar keeps your neck warm and dry. Choose from four different colors and enjoy ripstop durability with the Tempo Softshell Jacket. Stash your mp3 player in the chest pocket to listen to music as you jog or hike. Women who have worn this jacket say they love the extra room in the arms as well as the elastic cuffs that keep arms toasty. We can’t feature a Marmot review without mentioning that the company adheres to bluesign approved materials and manufacturing practices. The group also donates to non-profits like Guide Dogs for the Blind and the Cancer Climber Association. Eileen Fisher is an American apparel woman-owned business that features sustainable, eco friendly and organic apparel. The flowy, feminine styles of the product line make the company’s style unique. Eileen Fisher is also a socially responsible company. Fabrics and fashions are made from sustainable fabrics under fair trade conditions. In fact, a quarter of the company’s line is made in the USA. For our Eileen Fisher review, we’ve selected the Striped Boxy Pullover Sweatshirt. This casual style is breezy and light, perfect for late summer cookouts or coffee shop visits. The Eileen Fisher Striped Boxy Pullover Sweater is made from 85% Tencel Lyocell and 15% Merino Wool. Eileen Fisher is a Certified B Corporation and frequently gives back to socially conscious efforts. The company launched the Eileen Fisher Leadership Institute, which helps young women find leadership opportunities. Eileen Fisher Renew is a clothing recycling program in which donated clothing is repaired and upcycled, keeping materials out of landfills. Brooks is another activewear company, but one that’s a little different from others. Brooks focuses on one sport: running. Shoes, leggings, outerwear, accessories and even sports bras are all designed sustainably to make running more comfortable. We’ve chosen the Women’s Greenlight Capri for our Brooks review because we think it encompasses the Brooks mission. This capri pant or leggings is styled to move with you while you run. A capri length prevents the pant from riding up as you jog or run, and DriLayer fabric keeps you cool and dry. The form fitted design is both flattering and utilitarian: the Greenlight Capri will feel like a second skin whether you’re trail running or just working the treadmill. Brooks is a sustainable, eco-friendly company that continually gives back to non-profits and encourages employees to do so as well. The business encourages employees to donate $300 worth of merchandise to a charity of their choice. They also offer paid time off to volunteer with groups like Habitat for Humanity and Northwest Harvest. In addition to its give back programs, Brooks has partnered with bluesign and Sustainable Apparel Coalition to ensure your running gear is made in a sustainable, socially responsible way. Last on our list of the top bluesign approved, Certified B Corp apparel is our Royal Robbins review. Royal Robbins is a bluesign partner, which means the fabrics used in your women’s apparel are sustainably sourced and ethically made. In addition to offering earth-friendly products, Royal Robbins has partnered with I:CO to reduce waste in landfills; The Royal Rewear Program allows consumers to recycle clothing in exchange for a 25% discount on future purchases. This cowl neck tee from Royal Robbins is made of sustainable fabrics: hollow polyester, Tencel and 5% Spandex for a little stretch. Ruched sides give this shirt a very flattering fit and the cowl neck is flirty yet modest. Choose from five different colors and enjoy the soft feel of the natural fabric. Women who have worn this shirt say it’s perfect for cooler spring and fall weather. In addition to its own recycling program, Royal Robbins donates annually to some great non-profits. The Conservation Alliance, Adventure Travel Conservation Fund and Yosemite Conservancy are a few examples of groups that have benefited from Royal Robbins’s donations. Shana Thompson is a full time professional writer and editor. Shana has worked extensively in the fields of content marketing, on-page and off-page SEO (guest posts, backlink acquisition), and creative writing. As an experienced pro content writer, Shana has worked on several magazines, publishing companies and marketing agencies. Many recent projects have included everything from nutrition and health services, where a lot of research and citations were needed, to writing about health, sustainable, eco-friendly products.